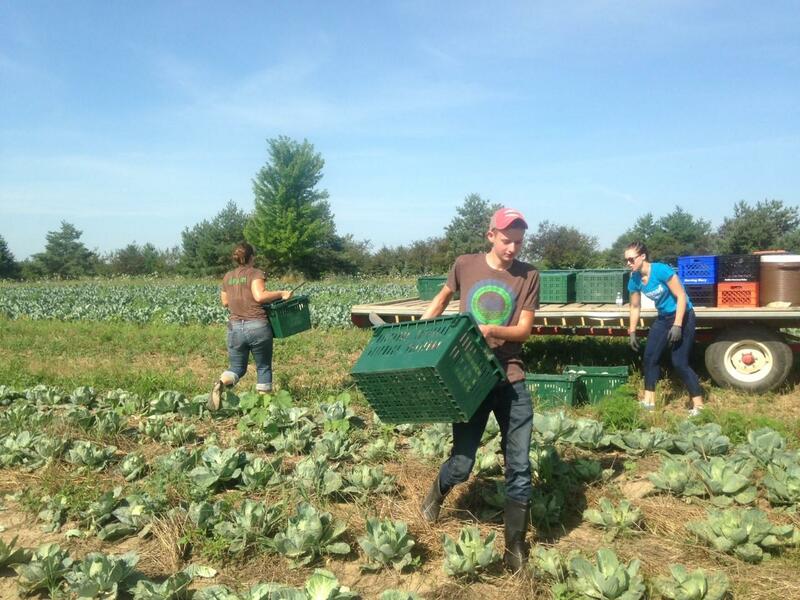 Cole Compton on cabbage harvest duty at Hunger Task Force Farm in Franklin. Cole Compton is about to begin his senior year at Shorewood High School’s New Horizon Charter School. 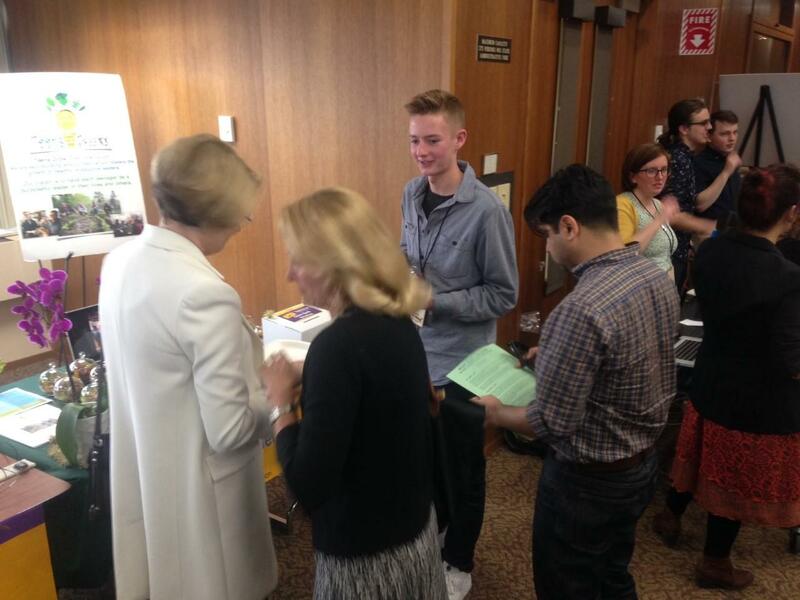 Cole Compton in 2014 while pitching his business idea to fellow Teens Grow Greens interns. WUWM's Susan bence met him a few years ago Weber’s, a greenhouse on Green Bay Ave off Capitol Drive. Compton was the youngest intern in the then fledgling after-school, paid internship program called Teens Grow Greens. Compton, a seemingly shy guy with blond hair sweeping into his eyes, was the first to come up with a business scheme and had to pitch the idea to his fellow interns. It had to be a nerve-wracking moment; the teens barely knew one another. “I’m going to tell you my market plan for my business, which is the Green Earth Terrarium,” Compton said. His terrariums would air plants, or small plants that require no soil and a minimum of watering and maintenance. “I hope to sell them for about $10 a piece at farmers markets and events,” Compton said. Outpost Natural Foods' Zack Hepner with Compton. And, that's just what he did. Compton started selling at the annual sustainability summit in downtown Milwaukee, and later at the Westtown Farmers Market. Within a year, Compton sold his idea to Outpost Natural Foods stores, and Zack Hepner with Outpost was impressed. “He started off with the round bowl and the air plants and he kind of moved that to a hanging air plant and now he’s got the succulents and the beautiful teardrop glass. So I think he’s done just an excellent job continuing to innovate to help me buy them and help sell more terrariums,” Hepner said. Compton center explains Green Earth Terrarium at UW-Milwaukee entrepreneur expo. Fast forward to May 2016. Hair perfectly styled, at the top of his terrarium game, Cole Compton stands surrounded by interested folks at the UWM Innovators Expo. He’s the only pre-college entrepreneur in the room. “This is actually the two-and-a-half year mark that I’ve been doing this, and I just did the numbers and I’ve sold just over 2,000 terrariums,” Compton said. This event took place right before Compton was about to start his Hunger Task Force farm internship. 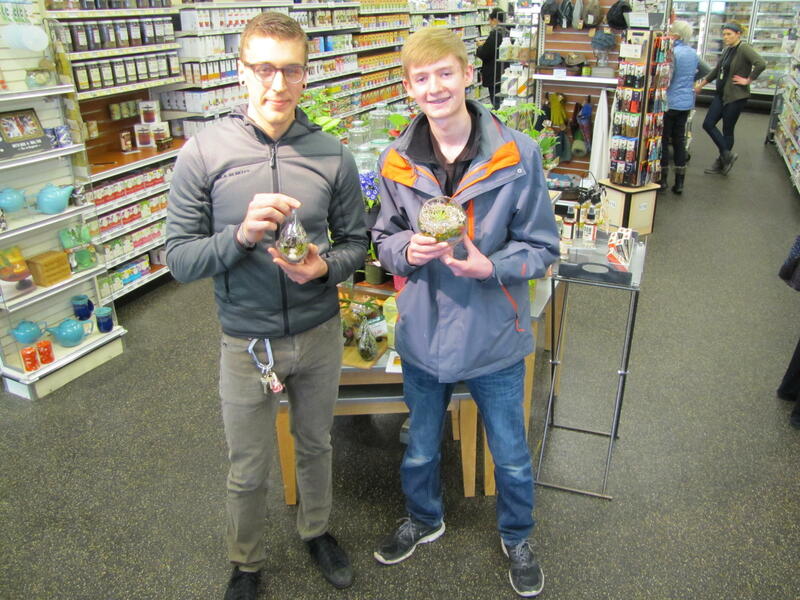 He planned to keep terrarium sales humming by hiring fellow high school students. “Yeah I’m going to be hiring two or three kids to work on either one or two farmers markets, whatever I have time for,” Compton said. Miles and miles south, on the job at Hunger Task Force’s 200 acre farm, Compton harvests cabbages on an already blistering hot summer’s morning. Compton reports how his business juggling strategy played out. “Once I found out that this is going to be eight-hour days of hard farm labor, then I had to switch out my plans, for the better actually. A big part of that is when you’re managing a company, you have to constantly be in contact with the people you are working with," he says. "So there’s not much time for me to be on my phone, checking emails, while I’m here." Today, Compton calls his Hunger Task Force Farm gig a dream internship – in the beginning, maybe not so much. “I would say the first two weeks, I would come home every night and I would instantly go to be, take off my work clothes, climb into bed, wake up in the morning just exhausted,” Compton quickly adds, “but ready to go, ready for another great day." Each morning Compton works with a fresh batch of volunteers, helping direct them through the day’s labor. But it’s some of the labor itself that he especially enjoys. "You know, I gotta say, we’ve got a Zero Turn mower, so it’s pretty fun, I get to whip around on that." Hunger Task Force Farm manager Matt King with Cole Compton. “Cole said that weeding is very relaxing for him, and so we informed him right off the bat this would be a very relaxing summer for him,” Matt King says. He's Hunger Task Force Farm's manager. Kidding aside, King can’t say enough about his young protégé. “Typically our interns have been older. We’ve had a series of interns who have been students at UW-Madison’s School of Agriculture and Life Sciences. So that’s been the typical candidate throughout the first years of the internship,” he says. Cole Compton reached out to apply for the position. “We had to consider whether he was a good fit and after spending some time with him, it was a resounding yes,” King says. Compton is a determined guy, but not everything comes easy for him. “You know with the dyslexia, how many things I’ve had to overcome to get to this place. How much work I’ve had to do - paperwork which is a huge barrier, just little things,” he shares. Compton says he’s learned to be open about his learning disability. “I’ve just been very open about that, and it’s helped me so much to get to that point. Not afraid to put myself in awkward situations,” he says. He’s learned to take risks. “And yeah for me, I would say the more danger I put myself in, the more uncomfortable I feel is the way I get so much experience, real life experience,” Compton says. As his senior year commences, Compton will explore what comes after that. “Going to an agriculture-based, Americorps is one of my options. There’s just so many things I have, and so many options which is such an amazing thing that I’m so thankful to have,” Compton says. And, with a twinkle in his eye, Compton announces, before his high school career ends, he might just roll out a new business venture, one that goes beyond a greener terrarium. “You know I think it’s safe to share at this point a couple of things that are a little bigger and a little bit more patented and need a little more steps, regulations….,” Compton says. 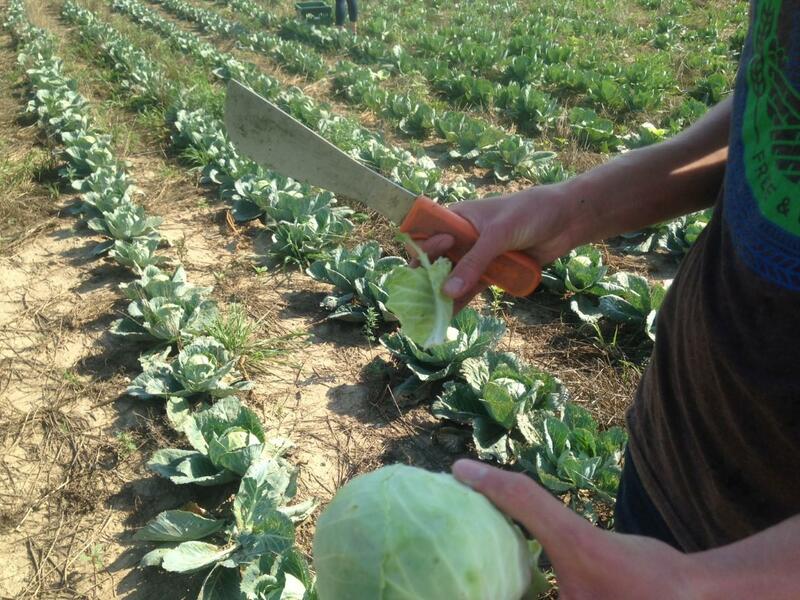 No more hints on that day, Compton needed to return his focus back to the next cabbage. After school starts, Compton will continue working there Saturdays at the farm until the first deep frost hits. The nine-month after school and summer program aims to arm students from across the Milwaukee area with hands on experience and skills that start with gardening, but grow into something larger. This week, year two of Teens Grow Greens wrapped up. Charlie Uihlein came up with the idea. He teaches honors history at Messmer High School, but when he’s not doing that, Uihlein is thinking about ways to improve Teens Grow Greens. 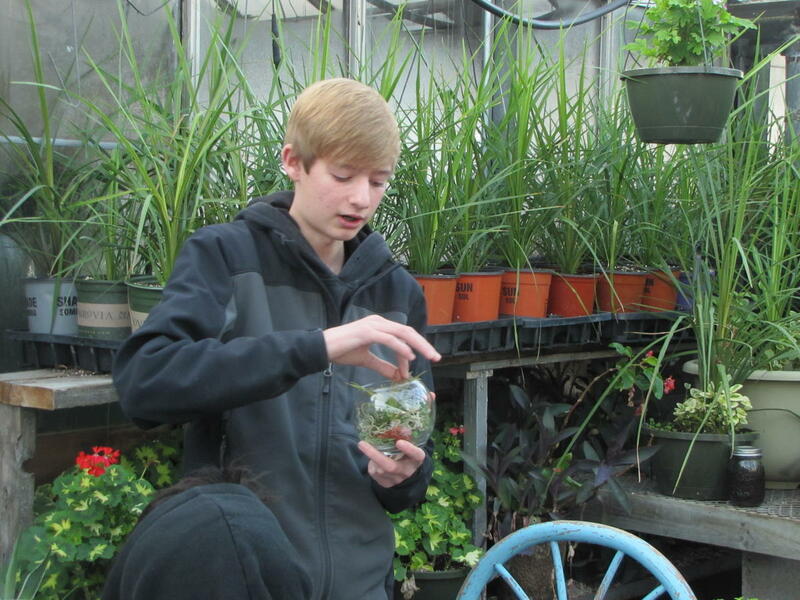 As a high school freshman, Cole Compton introduced his Green Earth Terrariums at Milwaukee's 2014 Sustainability Summit. This year, he was a presenter. Who Will Be The Next Environmentalists? Today is Earth Day. Wisconsin’s own Senator Gaylord Nelson came up with the idea 40 years ago, to call attention to dangers threatening the environment. The U.S. Senator hoped to inspire awareness and action. On this 40th anniversary, we stop by several schools, in search of future environmentalists. It’s a Saturday, but a dozen or so Whitefish Bay High students are digging their hearts out on the west side of school. 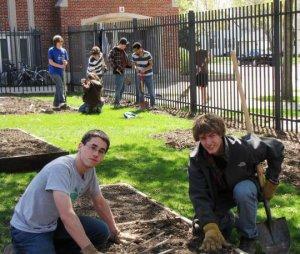 They’re installing a series of raised vegetable beds – some for the school, others for the community. I’ll step aside and let senior Micah Leinbach explain.